Magic has never happened for me inside a cubicle or when face-planted in front of my computer (although I am an admitted digital junkie). For those of you who know me and/or have followed this column, then you understand that I am most alive when I am in an outdoor setting. Whether it’s wandering the valleys and glaciers of Torres del Paine National Park in southern Chile, sailing a tall ship through the waters of the San Juan Islands, or tossing beach-gathered “dream” feathers from the top of Mt. Whitney, it is adventure that fattens and fills my soul. I believe that the best part of me would die within the confines of an office. And to that end, I have chiseled, chipped and crafted a kind of do-it-on-the-spur lifestyle that provides me a decent sense of mobility. There is humor to this choice. When I was younger, I was sure that money was the key to my future happiness. My Thurston Middle School yearbook states that what I wanted was “to be a millionaire.” What a grand surprise to discover that while money affords many “things” and at least a perceived ease, it is not what brings me joy. What price can be placed on the silent honoring of a sunrise experienced on a remote beach? Of being present to that moment when night becomes day and the world is once again painted in color? There are no numbers to mark the rich experience of the early call and sweeping wings of the pelican, the tern and the osprey. The last few years, my travels have been primarily focused in Baja, where I’ve had a sort of “gringoized” experience of Mexican culture and customs. The towns of Baja are far from the formalized world of the capital, and for the most part, steeped in a relation and reverence for the sea. It is this reverence, born from growing up in Laguna, that ties me to the experience. 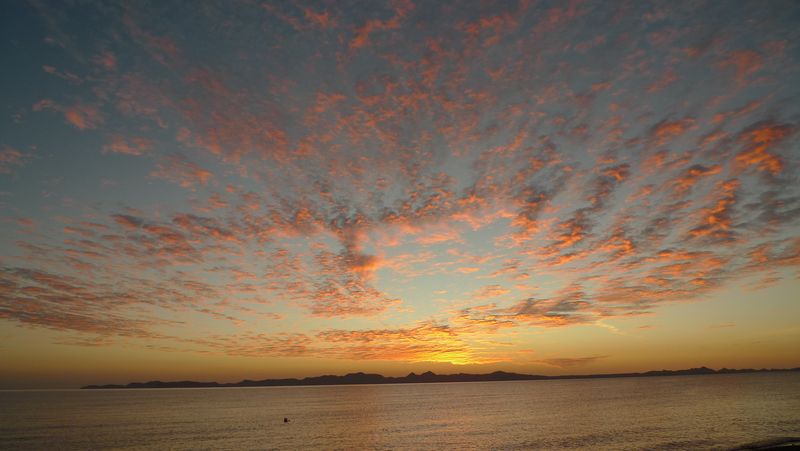 The largest population centers of Baja are fringed on both the Pacific and the Sea of Cortez coastlines, and survival has been based on fishing and a commensurate healthy ocean. Once identified by Jacques Cousteau as one of the world’s richest seas, the waters continue to team with life. In other words, no oil spills here. My friends, Jeanne, Mark and Alexander, along with Steve and I, chartered a ponga last week for a day of snorkeling and beach play at Coronado Island. The youngest volcano in Baja, Coronado is a small windswept cone that sits a little more than six miles from Loreto, and a mere mile off the coast to the north. A wide turquoise bay on the west side of the island has been carved by the elements, and it is fringed with exquisitely white sandy beaches. The backside, or east coast of the small island, is rock faced and has no beaches. Here is the home of a small sea lion colony, the nesting ground of blue-footed booby, osprey, and magnificent frigate bird, and shallow rocky reefs laden with all color and kind of small fish. Water temperatures this August hover in the mid-80s. Our boat captain, “Duby,” stopped the engine in a small cove. After donning snorkeling gear, four of us jumped into the water. Instantly, I was surrounded by a school of beautiful and curious yellow and blue striped sergeant majors. When I was able to hold still, they swam close to me, observing me, as I observed them. In the shadowy sections of the rocky bottom, teaming groups of fish fed on plant life, plankton — and each other. Tiny sardines, both the Cortez and the King angelfish, rainbow wrasse, puffer fish, a parrotfish and pargo joined in the display. Larger blue groupers swam next to tiny damselfish. From the surface, it is hard to imagine this other world, this ecosystem in and unto itself, that exists just below the water line. We landed for lunch on the smaller of two white sandy beaches, and were rewarded with the place all to ourselves. We laughed about “Gilligan’s Island” at the sight of an abandoned shoe. Mark and Jeanne played frisbee. Alexander napped. Two needlefish swam right in front of my feet as I watched a solitary pufferfish gorging himself on micro-sized sardines. A long-legged sandpiper, foraging for tiny crabs in the sand, walked right up to the beach chairs as if to say, what are you doing on my beach? Another fabulous day in and on the water. My kind of zen space. My kind of office.